COURTESY OF KAREN GERHARDINGER | MIRROR REPORTER — When Ron Freier joined the Whitehouse Police Department in 1984, it didn’t take too long to get to know most of the residents. “Whitehouse only had about 2,200 people at the time. Instead of an address, we’d just say, ‘It’s next to so-and-so’s house,’ and we’d know where to go,” the officer said. 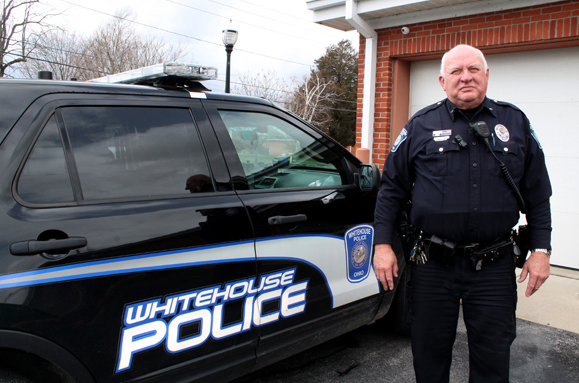 The 32-year member of the Whitehouse police force hopes to see many of the residents he’s gotten to know over the years, as he retires from the department on Friday, April 29. 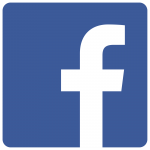 An open house will be held at Village Hall from 3:00 to 6:00 p.m. that day. At 67, Ron said it’s time to hang up his hat. “This is a younger man’s job. I’ve enjoyed it, though. I’ve met a lot of fantastic people,” he said. When he graduated from Whiteford Agricultural School in 1967, Ron knew he was going to get drafted for service in Vietnam. “When I turned 18, it was like, ‘Happy Birthday! Now go get your physical.’ I decided if I was going to join, it would be on my terms,” he said. He enlisted in the U.S. Navy, serving as a boatswain mate third class. During that time, he saw southern Europe, the Mediterranean Sea and the Caribbean. His ship was also prepared to do the recovery efforts for the Apollo 7 manned space launch should the crew have had to eject over the Atlantic, but that didn’t happen. He did, however, experience a collision at sea, when another ship’s officer misinterpreted signals. “We had been up repairing lifeboats late. I had just gotten to bed at 3:00 a.m. and they came over the PA and told us all hands on standby for a collision. I felt the impact, grabbed my clothes and went up top. I could have walked to the other ship it was that close,” he said. The crew spent over a week in Malta while the ship was repaired. Upon his return stateside, Ron headed to the Criminal Justice Training and Education Center in Toledo and worked as a security officer at the 180th Fighter Wing for 19 years. In 1983, he began riding along with Whitehouse police, joining the department part time in 1984 and full time in 1987. Back in the 1980s, the problems were similar: speeders and drunks. Police regularly checked the No Name Bar (where Local Thyme is now), the Copper Lantern (now Divine Reflections) and the Whitehouse Inn. Outside of town on SR 295 was the Evergreen. “We had to back up the county there on bar fights,” Ron said. 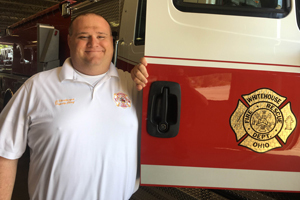 The toughest part of his job was delivering the news to a resident about losing a loved one. And he won’t forget reporting to the scene when a 7-year-old boy drowned at a campground. “That was my first and only child death. It takes a while to get over that,” he said. Domestic disputes and domestic violence were also a problem, but officers had to get a sworn statement from a witness to bring in a suspect. That’s changed. Officers can bring someone in on suspicion of domestic violence, even without a statement. Many of the laws have changed over the years, and officers get regular updates. Now, instead of hand-writing all of the tickets and reports, it’s computerized – which is better than trying to write with cold hands in below-zero temperatures. “I won’t have to deal with 25 below zero wind chills any more,” he said. In his retirement, Ron and his wife are heading to Georgia, where they plan to buy a home. While he might take on a part-time job in security or law enforcement, Ron also hopes to get in some fishing and relaxing. COURTESY OF KAREN GERHARDINGER | MIRROR REPORTER — While anglers can fish from the shoreline and hikers can venture around the edge of the Whitehouse quarry, its waters have been off-limits to boats for several years. Now, as part of Blue Creek Metropark, the large quarry will soon be open for stand-up paddle boarding, canoeing and kayaking programs sponsored by the Metroparks of the Toledo Area. Non-motorized boating is the fastest-growing programming area for the Metroparks, with 3,000 guests participating last year, said Dave Zenk, deputy director. “We have a generation of people who have not grown up outdoors. We need to teach them skills so they can enjoy activities like birding, canoeing, camping and archery,” Zenk said. 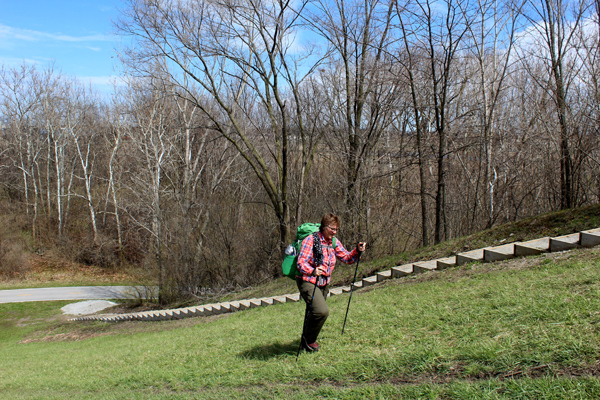 While two new metroparks – Westwinds and Wiregrass Lake – cater to these outdoor activities, Blue Creek Metropark, with the large quarry, glacial grooves, 20,000-square-foot barn, wetland and oak savanna offers many opportunities for exploration, he said. Last week, Zenk, along with chief of operations Joe Fausnaugh, met with Whitehouse village administrator Jordan Daugherty, Public Works Director Steve Pilcher and council members Rebecca Conklin Kleiboemer and Bill May. Standing in the small gravel lot at the base of the sledding hill, they discussed what improvements can be done to activate the site as soon as possible. The partners – Anthony Wayne Youth Foundation, Nature’s Nursery and Lucas County Soil and Water, the village and the Metroparks – have all signed off on the long-term conceptual plans for passive and active recreation areas, with portions extending from Waterville Street near the library all the way south to Neapolis-Waterville. The first step, Zenk said, will be the installation of at least one sign at the Providence Street entrance. Other priorities include enlarging the parking area near the base of the sledding hill, sprucing up the pavilion and cleaning up around the quarry to make it more readily accessible for programs. Already, Epic Toledo has booked a group of 200 to come for a stand-up paddle boarding session in June. The Metroparks plan to book similar parties with groups, or host “try-it” events with a variety of outdoor activities. This concerns May, who asked how 200 cars could be accommodated at the base of the hill, or even in the large parking lot, which is filled with potholes. He asked that the proposed roadway running from the Whitehouse Library entrance to the lot be moved up on the list of priorities. That’s up to Whitehouse Council, Daugherty said. Each step of the plan will need approval and funding. He and Pilcher agreed to look into costs for improving the lots. Conklin Kleiboemer said a swimming facility – whether at the quarry or elsewhere – has long been a request of residents, who might be perturbed that other activities are being offered first. “Swim at your own risk” is not an option any more, Zenk said, so even if physical changes were made so the quarry had a more gradual slope for a beach, the area would require lifeguards during the summer months. However, the Metroparks will look into what the costs would be to include that option in the long-term plan, he said. In the meantime, Zenk said he should learn late this summer if the Metroparks received a $200,000 grant to complete a multipurpose trail that already runs behind the sledding hill to Stiles. The new path would run parallel to Stiles and Providence Street. 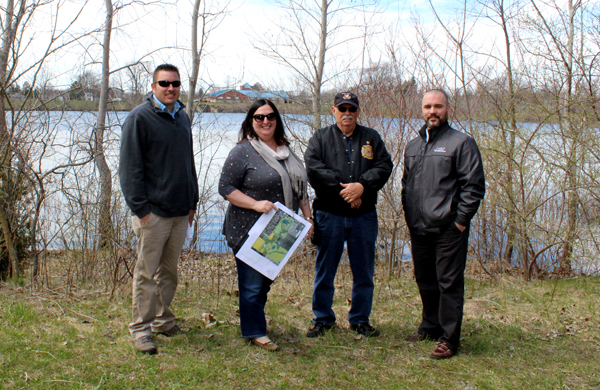 Whitehouse received a NatureWorks grant last year to cover the cost of putting in a boardwalk along the eastern and southeastern edges of the quarry, where a dirt path now exists. That should be put out to bid by June and installed by the end of summer, Daugherty said. Each of the partners in the Blue Creek Metropark project will allot funding as able. Whitehouse Village Council will vote on each piece separately, Daugherty said. For information on Blue Creek Metropark, visit www.metroparkstoledo.com.